The Marvel Shop has just released it's latest specials, with gifts for those targeting a novel way to set the heart of their favourite fan boy or girl a-flutter. 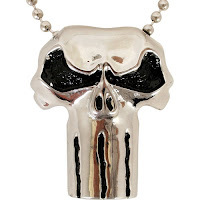 Included in the line-up, this shiny Punisher: War Zone pendant, because nothing says 'I love you' like a shiny skull on a chain, with one hell of an attitude. See the full range of Marvel gifts for the big day right over here.